Deborah Swan, from Toukley, New South Wales, Australia, asked for entertainment ideas for her Gorokan High School Class of 1980 reunion. Denise Silva of Great Reunions, Garden Grove, California, cautioned that too much entertainment is just as bad, if not worse, than no entertainment. The majority of classmates want to spend their limited time reminiscing, not watching a show. She has been successful having the current school band and/or cheerleaders come for a brief alma mater and traditional cheer just before the awards. They do it for a small donation. Another suggestion is to have classmates send pictures before the reunion (with their name and address on the back) to be made into a video. Darla Methey at Reunions By Design in El Cajon, California, reports that they have a company come in with blackjack and crap tables. She says you can find companies in the yellow pages under “entertainment,” or contact the Convention and Visitors Bureau for referrals. The company they use costs about $100 an hour. Sometimes they offer raffle tickets at the end of the night for exchange of chips, with a prize of a 3-day/2-night stay in Las Vegas. These games are good for spouses and guests at reunions because they are happy and have something fun to do while the spouse enjoys talking to classmates. One of the DJs Methey hires devises contests. One requires a group of five to eight male classmates to strike poses or do a skit. Then the females do the same. Methey reports it’s great for laughs and a fun opener for the committee. They’ve also had comedians or a disk jockey who plays Name That Tune. Nancy Shirey at A+ Reunion in Ellicott City, Maryland, adds a trivia game. Keeping that in mind, you are ready to start looking for entertainment. The first thing you should do is start talking to your classmates about who they work for and who they know. A lot of times we find that someone owns a company that has something we can use or knows someone that they can talk into donating a service or selling it to us at cost. Possibilities include Casino Nights, magicians that go table-to-table, a comedian during dinner, or just a fun icebreaker game. Local libraries offer books that describe hundreds of party games. Another questioner wanted suggestions for “fun things to do during a dinner program for a 40th reunion” but we asked the experts to make their answers appropriate to any reunion. We consulted members of the National Association of Reunion Managers (NARM). 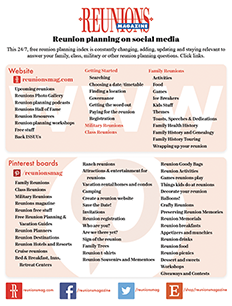 Carolyn Moore of Reunion Planners of Texas in Magnolia, Texas, offered these great ideas. Classmates have gathered to “get back in touch” with old friends. To help them find out about each other and provide conversation starters, we use the following method to determine who “wins” the certificates presented for longest married, most children, most recently wed, youngest child, traveled farthest, changed most, least, etc. Information is NOT compiled beforehand but on the spot. The Mistress/Master of Ceremonies says, “Anyone who traveled more that 50 miles to get here tonight, please stand up. Those who traveled more than 100 miles, remain standing,” and so on, until you have a winner. Next, “Will everyone who is married please stand up. If you’ve been married more than five years [then 10, 15, 20, 25, 30 years]remain standing,” until you have a winner. It sometimes comes down to counting years, months and days. Ask all the questions in essentially the same way. Standing up and sitting down makes it more fun. I find it best to do only five to seven topics, as it takes a long time and classmates want to talk to each other about what they’ve discovered. Also, I hire a DJ who “does his homework” and studies websites about what was going on (prices, #1 songs and headlines) during the years the class was in high school. He and the photographer work together to “recreate” groups; people who played together in small bands, sang or played sports together and those who went to elementary school together. Carol Riley, Owner of Reunions Unlimited in Olympia, Washington, can always be counted on for very sage advice. Carol is also Past President and Treasurer of the National Association of Reunion Managers (NARM). Whatever you do, make it short and funny. You will lose your audience if it is too long and dry. Be prepared to give awards you may have forgotten about—classmates may suggest one or more. Also brace yourself for the program that may not go as expected; technical difficulties may arise (this happens a lot) or the group may be too large or the crowd may not stop talking (try again later or just drop it). These are fun things to do for the program in no particular order. The traditional awards include who traveled farthest or lives closest, married longest or least or never or most often, greatest number of children, grandchildren, great-grandchildren, highest degree of education, still drives or owns the same car he or she had in high school. The list goes on and on, but never do “who has changed the least or most” as that can be very embarrassing. We recommend having an energetic and enthusiastic emcee who asks questions. Build a theme around a period car or other unique era or high school item. 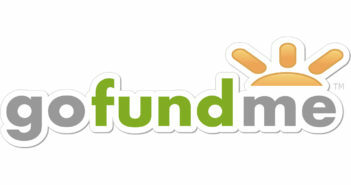 Bring back the cheerleaders, pep squad, school mascot (give them a donation). Reunite school choir members and have them sing the school fight song. Pass the microphone for introductions by table. Open the microphone for interesting stories. Do a slide/video/music show with pictures from the past and present. Have a call and response trivia game ( i.e., “Who remembers the name of the school nurse”) with funny awards. Have a raffle: committee members solicit donations, give everyone a ticket for a drawing, and give exciting gifts. Revive a high school band for a song or two. This is all fun, but on a somber note, please remember to have a memorial display and a moment of silence (easily incorporated in your welcoming and call for dinner) for deceased classmates. Remember, each of them was somebody’s best friend! Previous ArticleWhat to do with leftover money? Next Article Need help finding classmates?